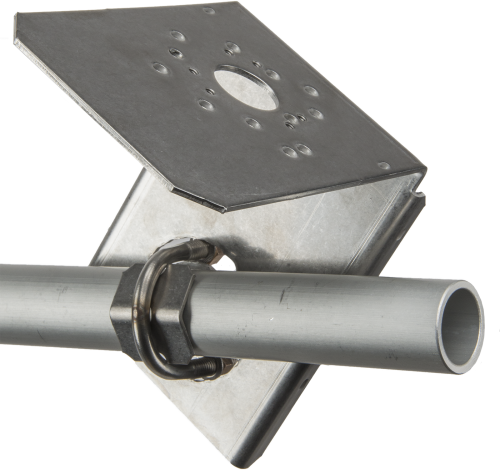 The CM255 is used for most applications that require mounting a solar sensor at adjustable angles. The CM255 is designed to work with masts, crossarms, or poles that are 1.0 to 1.5 in. OD. It is not designed for applications using a rotating shadowband radiometer (RSR). CMP11-L Assumes the CMP11 is not housed in the CVF4 Heater/Ventilation Unit. CMP21-L Assumes the CMP21 is not housed in the CVF4 Heater/Ventilation Unit. CMP6-L Assumes the CMP6 is not housed in the CVF4 Heater/Ventilation Unit. CS300-L (retired) Requires the 18356 Leveling Base. LI190SB-L (retired) Requires the LI2003S Leveling Base. LI200S-L (retired) Requires the LI2003S Leveling Base. LI200X-L (retired) Requires the LI2003S Leveling Base. The CM255 is NOT compatible with rotating shadowband radiometers (RSRs).